Folli Follie is a worldwide respected lifestyle fashion brand who design, manufacture and retail jewellery, watches and accessories to women. Their vision is to inspire women all around the world with Folli Follies unique designs and concepts. Let’s get down to the detail on how to save money whilst shopping at Folli Follie. It’s first worth pointing out they have on average 250 products in the sale at one time, this number will of course flucuate depending on the time of the year, but keep that number in your mind. If you see a number lower than 250 it is safe to assume they are coming to the end of a sale period, if the number is higher then assume they have just restocked. What type of products do Folli Follie sell? Other big savings come from there delivery offering, all free UK delivery which is important for us busy money savers. There is nothing worse than when a business adds big delivery charges at the end of the checkout process. Our Voucher Saver experts have identified that the cheapest products on Folli Follie are the Pendants, they come in at roughly £10 for the cheapest one, with a saving of over 60%. Broadly speaking, 60% is the average saving you can expect to save at Folli Follie. Can I get Student Discount from Folli Follie ? Unfortunately Folli Follie are currently not offering student discount. If this is to change, we will update this part of the page with the highest available discounts for you. Which popular brands do Folli Follie sell? 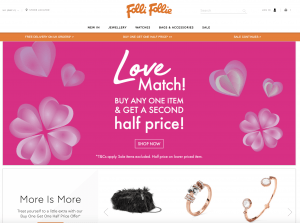 Folli Follie is a leading online womens fashion brand, they specialise in jewellery, watches and accessories. If you are looking for the perfect accessory to complete your outfit, then Folli Follie maybe the place for you. We recommend you see the latest Folli Follie discounts we have available. Big tip – Folli Follie newsletter subscribers receive exclusive discounts, so don’t miss out.